A mushroom is the spore baring body of a fungus which grows in damp, dank soil in shaded areas. You could cultivate your own mushroom crop by setting up an area in your basement which is kept dark and soil is moist. I like mushrooms in salads and recipes, but growing them myself is just a hobby I don't need to get involved in. 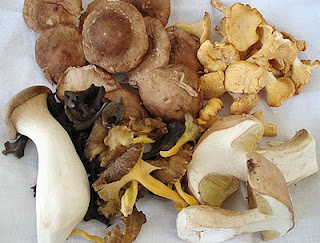 Depending on how populated an area you live in, the local markets will carry the typical white button mushroom, but they will also carry other varieties (cremini, portobello, enoki, chanterelle, oyster, etc). Not all mushrooms are the same as they each have their own flavor, texture, even scent and experimenting with the varieties is basically how you'll find out what works with the recipe you are trying to create. For example, portobello mushrooms have a firm texture and beefy taste; a large grilled portobello can take the place of a beef hamburger for vegetarians. A good source for information about the varieties is <a href="http://www.foodsubs.com/Mushroom.html">Cook's Thesaurus</a> which has photos and descriptions. When having grilled foods, sauteed mushrooms and/or onions is a perfect accompaniment; providing not just added flavor, but moisture and texture. One way we enjoy steak, roast or London broil is with a sauce made with mushrooms, but not just a "cream of mushroom" sauce. First I marinade the meat overnight in a mixture of (1/4 cup)olive oil,(1 tsp each of)salt, ground black pepper and garlic powder. The next day I place the meat on a jelly roll pan, sprayed with nonstick cooking spray, and place it under the broiler(7 minutes per side). Then I finish cooking off the meat in a 375F oven until the meat thermometer reads medium rare. While the meat is finishing off, I begin working on the mushroom ragu; a simple side dish of salad and warm rolls or crusty bread is the perfect finish for this simple meal. So jump into an adventure with mushroom varieties, but if you feel the urge to hunt for wild mushrooms, BE CAREFUL, as there are many poisonous varieties. Study up on them and if in doubt, leave them out...of your gathering basket. In a large skillet, medium heat, saute’ onion till soft; add garlic and saute’ for 2 additional minutes. Add mushroom mix, salt, pepper; mix thoroughly. Increase heat to high, remove pan from stove, add port and return to heat; let alcohol burn off. Add broth and let simmer until liquid is reduced by half; stir occasionally to keep from sticking. 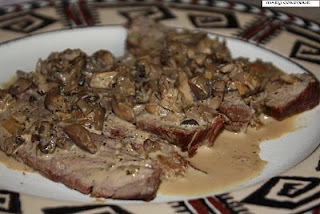 Add heavy cream, herbal mix; mix thoroughly and spoon mixture over steak, roasted beef or pork. **Note: if serving over chicken or other poultry, use chicken broth instead.